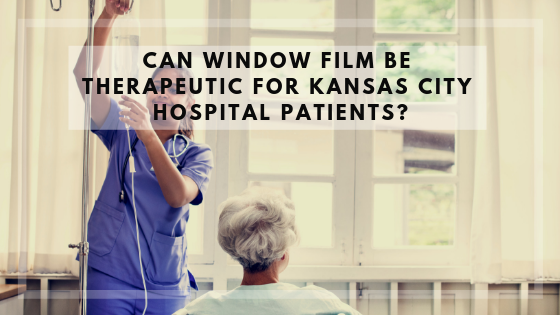 Can Window Film Be Therapeutic for Kansas City Hospital Patients? As a hospital, you want to provide the best care possible to your patients. Not only is it your job to help patients with whatever health issues or illnesses they are presently experiencing, but it’s also your responsibility to assist with their long-term recovery as well. Recovery starts immediately after treatment, while patients are still in your care. By installing hospital window film for your Kansas City medical center, you can help your patients recover more successfully and quickly. Here’s how. Getting plenty of natural light is important for our bodies when we’re healthy, but it becomes increasingly crucial when we’re ill. Light has a direct impact on the body’s circadian system. The circadian system plays a key role in maintaining many bodily functions, including sleep and wake cycles, digestion, body temperature regulation, and hormone production. Studies show that an increased exposure to sunlight helps boost circadian system functions, which in turn may improve sleep, reduce the length of hospitalization, and create feelings of happiness and contentment for patients. Hospital window film helps Kansas City healthcare facilities increase the amount of natural sunlight that comes into their building. Hospitals can use solar control window films, such as Solar Gard window film, as an alternative to blinds to create privacy. Unlike curtains and window shades which block the sun, window film provides a high level of natural light transmission. Much like textured glass, privacy window film distorts views of objects and people within a room. Light is allowed in, but patient identities and activities are unable to be seen and are kept confidential. Studies suggest that Kansas City hospitals with window film may experience an improvement in patient satisfaction and recovery times. Boost patient morale and improve the appearance of your Kansas City hospital with window film. Call Green Light Window Films today to schedule an appointment for installation.